NEW CANAAN, CT, Oct. 4, 2000 – Irving Levin Associates, Inc. (www.levinassociates.com), a provider of financial information and publisher of research reports and newsletters on the health care industry, today announced its purchase of two newsletters from Strafford Publications. Levin is purchasing the biweekly Jenks Healthcare Business Report as well as Jenks Subacute Business Report, from the Atlanta, Georgia-based company. This acquisition is a good match for Levin and adds to the growing roster of health care business publications. Levin publishes three monthly newsletters and several annual reports, including The Health Care M&A Monthly, The SeniorCare Investor and The e-health Investor. In addition, the company’s Health Care M&A Information Service includes weekly updates delivered by e-mail to subscribers of The Health Care M&A Monthly as well as a 100-page quarterly report. “The two Jenks publications are very complementary to our current line of publications and represent a tremendous opportunity for our firm,” stated Eleanor B. Meredith, Publisher. The two newsletters cover mergers and acquisitions, initial public stock offerings, insider trading, regulatory trends and business alliances across the entire health care spectrum. For more information on Levin’s products, check its Web site at www.levinassociates.com. 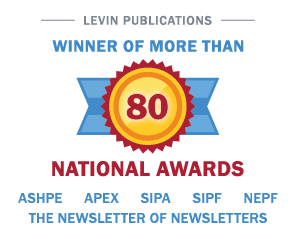 To subscribe to any of Levin’s newsletters, call 800-248-1668. PHYSICIAN MEDICAL GROUP, HOSPITAL AND LABORATORY SECTORS CONTINUE TO DOMINATE HEALTHCARE M&A MARKET According to Irving Levin Associates, Inc.